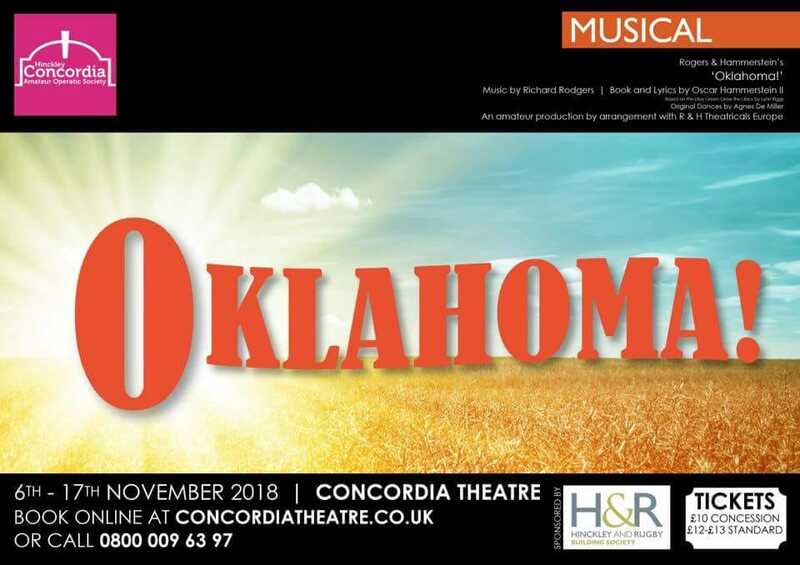 Promo: Oklahoma! by Hinckley Concordia AOS. 6-17 Nov 2018. – East Midlands Theatre. Promo: Oklahoma! by Hinckley Concordia AOS. 6-17 Nov 2018. The first musical written by the team of composer Richard Rodgers and librettist Oscar Hammerstein II. Full of classics, from the opening number of ‘Oh, What a Beautiful Mornin’ taking you through a sumptuous and rousing score full of wonderful songs such as ‘The Surrey with The Fringe on Top’, ‘People Will Say We’re in Love’, ‘Many a New Day’, ‘I Can’t Say No’, and the final rousing chorus of ‘Oklahoma!’. As the music soars you will be carried along on the emotional journey of one of the most famous love stories in musical history. Promo: Curve Leicester: full casting of White Christmas.